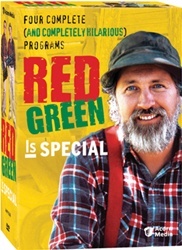 For no particular reason, we’ve taken four Red Green Specials and put them together into this one unique DVD Collection. If you’re made of money, you can buy them individually but you’ll get a lot more value in this packaged set. And the four DVD’s can also be used as matching coasters for your next Euchre night. It’s a no-brainer – just like you expected. Set includes - The Red Green Story, Hindsight is 20/20, We Can't Help It We're Men, and Duct Tape Virtuoso Deluxe.